You are currently browsing the Bringing Jerry Zimmer Home blog archives for May, 2013. 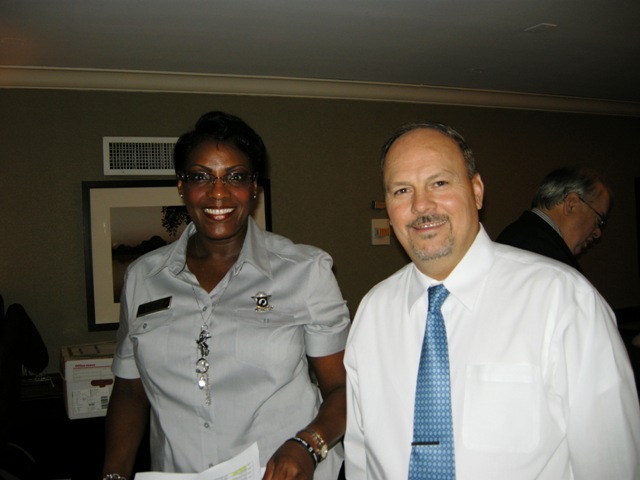 The 44th Annual Meeting of the National POW/MIA League of Families takes place in Washington, D.C., June 13-15, 2013. By virtue of the meeting’s longevity, leadership and roster of distinguished attendees, it is a big deal for Vietnam War families with loved ones still unaccounted-for in Southeast Asia. The Defense Prisoner of War/Missing Personnel Office (DPMO) hosts the event that draws 250 to 300 people, including Congressmen, active duty and retired generals and foreign dignitaries, some of whom travel from as far away as Vietnam. For over 35 years, the League has had its own in-house guiding force, Ann Mills Griffiths, who now serves as Chairman of the Board, and a lot more. Although the meeting is business-oriented with families seeking answers and case updates, there is a social component in which familiar faces, year after year, make the meeting a “kumbaya” occasion in the best sense of the word, despite the sad premise that brings everyone together. One of the people that I enjoy seeing at the Annual League meeting is Hattie Johnson, Head of the POW/MIA Casualty Office for the Marine Corps — even though the reference to “casualty office” takes me back to the worst day of my life when I learned that my first husband, Capt Jerry Zimmer, an F-4 pilot shot down in Vietnam on August 29, 1969, was not coming home. A young Marine Corps Captain, making his first ever casualty call, showed up at my door and was just as devastated, trying to deliver the news, as I was to hear it. Now 40 years later, it would be an honor to welcome Hattie into my home, as a friend, or as a casualty officer, with news that Jerry’s remains were identified and coming home for burial in Arlington National Cemetery. In fact, the best part of her job is “the day I call you and tell you he is coming home,” says Hattie, during a recent conversation, from her office at Marine Corps Base Quantico. Regardless of the years that have transpired or the specific past war that was fought, when the remains of an MIA Marine have been identified, Hattie calls the Primary Next of Kin (PNOK) – if known – to arrange a time when she can visit the PNOKs home and present a final briefing on their loved one’s case. Conveying the message is not always as easy as it might seem, since families may have given up hope and moved on – literally — to a different location. Hattie interfaces with all the different groups involved in the MIA process, especially DPMO and the Joint POW/MIA Accounting Command (JPAC), and almost always tracks down the PNOK eventually or locates a surviving family member. Logging thousands of miles, Hattie travels throughout the United States – 50 to 60 days a year to conduct family notifications, and consequently is a critical component in the closure process. Hattie takes her job seriously and never forgets a case, but no doubt remembers even the smallest details that were particularly unique, as in the case of 1st Sgt George Humphrey, a 29 year-old Marine killed in action in WWI, who finally came home on June 23, 2009. “It was the oldest briefing I have ever done,” said Hattie, clearly amazed at the details that began to unfold as she learned more about the case from anthropologists at JPACs Central Identification Laboratory (CIL), located at Hickam AFB in Honolulu. Before Hattie conducts a briefing, she does her homework. “When I receive an Identification Book, I become a family member,” said Hattie, who tries to focus on the details that a sister, wife or distant relative might want to know – even when there is a long generational gap between the MIA and surviving family members. She also knows that briefings can be emotional. “All of us cry – I think it’s a happy and sad reaction.” Hattie explains that most families never expect that a loved one’s remains will be found. Indeed, Humphrey’s story captured national media attention, and with good reason. According to Hattie and others, young Humphrey was serving with the 6th Marine Regiment that was part of the first, U.S.-led offensive at St. Mihiel, in northern France, under the command of General John “Black Jack” Pershing. The unit was caught in the middle of a contentious battle and Humphrey was killed instantly when a German bullet penetrated his flimsy steel helmet. Thanks to a French relic hunter, Humphrey’s remains were returned to the United States, where they underwent a year of forensic testing in JPACs laboratory. 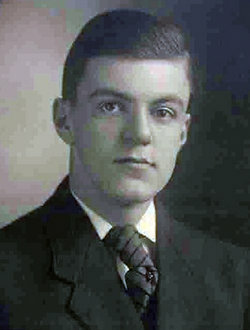 The material evidence was nothing short of an anthropologist’s dream, consisting of the clothing and gear Humphrey was wearing at the time of his death – the rusted helmet still covered his intact skull; his chest area contained clips of rifle ammunition; boots were still on his feet; and his favorite homemade pipe, 14-carat gold fountain pen and dog tags were also with him. Hattie tracked down Humphrey’s extended family members, and they were thrilled to welcome a distant, long-lost cousin back home after being MIA for 92 years. One of the cousins was an 85-year-old woman, who was very sharp, according to Hattie, and showed her pictures of Humphrey’s parents during the briefing. 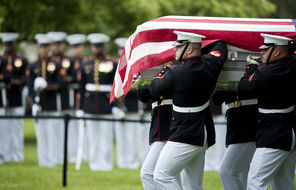 Humphrey was buried in Arlington National Cemetery on June 23, 2010. To a child in Vietnam, this innocuous-looking object could be a toy, instead of a deadly UXO, left over from the Vietnam War. In July, US Marines will train the Vietnamese military in the latest demining techniques, through the US Pacific Command’s Humanitarian Mine Action (HMA) Program, which is also being offered to other mine-affected countries in Asia Pacific. Vietnam has a big problem, and it won’t go away soon; however, when a contingent of United States Marines land in country, July 2013, their stopover is expected to be a step in the right direction for a country eager to resolve safety issues in order to reach new heights in the global marketplace. The Vietnamese government knows that cleaning up its environment is not an issue of going green, but rather going clean, as in demining the country — primarily in the rural areas — of its destructive explosive remnants of war (ERW) that kill and maim hundreds of its citizens every year, limit livelihoods and impede infrastructure progress. Although the number of UXO in Vietnam does not reach the levels of Laos and Cambodia, there is one statistic that places Vietnam in a class of its own. According to an article in a back issue of the Journal of Mine Action, the province of Quang Tri in central Vietnam is one the most seriously affected regions in the world. Author Zack Wall says that since the end of the Vietnam War, nearly 7,000 casualties have been reported in this province alone—exceeding casualty totals to date for entire countries such as Bosnia & Herzegovina, Ethiopia and Kosovo, to name just a few. Considered among the best of the best in their specialty, the 1st Marine Expeditionary Force, 1stExplosive Ordnance Disposal Company and others have added Vietnam to their list of humanitarian stops, as part of PACOMs Humanitarian Mine Action (HMA)program,* formed to assist countries in Asia Pacific. Not the first U.S. military involvement in Vietnam’s post-war demining efforts, but certainly the first for these Marines whose expertise is unquestionably rare, from a standpoint of skill and experience with combat- tested technology in the Middle East, where ordnance of every type has undoubtedly reached new levels of complexity – both on the ground and in the air, exploded and unexploded. The Marine Corps goal is to train the Vietnamese military on how to handle and dispose of UXO, using the latest demining equipment and technology, as both sides come together in a quest to rid Vietnam of its ERWs. The issue of UXO should not to be taken lightly by visitors to Vietnam — even returning veterans, who want to visit former battlegrounds in remote areas. 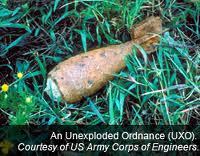 While time has helped to heal war wounds for many on both sides, it can do nothing to soften potential damage from UXO. 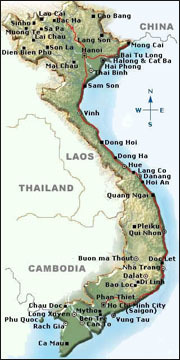 I have read that 40% of the duds in Vietnam, Laos and Cambodia are hazardous with a 13% probability of detonation. Cluster bombs had a significant failure rate, and there were several million dropped, especially in Laos, during that time. The problem is definitely real, and when the Joint POW/MIA Accounting Command (JPAC) conducts field operations in Vietnam and elsewhere, they always include an explosive specialist on their field teams. As the former wife of a Marine Corps jet pilot, shot down in Vietnam and still unaccounted-for, I can attest to the concerns that villagers in the rural sectors have for UXO. When retired Lt Col Gene Mares hiked to my first husband’s crash site, deep within the Que Sons, he followed our Vietcong guide’s footsteps, never deviating from his lead, knowing that Mr. Du had made the trip many times and was very cautious . In my case, I recall visiting a crash site outside of Saigon with VFW and VVA leadership, also following our guide’s lead, every step of the way, walking single file, before arriving at the site. I commented on an area that looked to be off limits and was told that it was restricted because of UXO – no one ventured in that direction. Helping Vietnam with its UXO problem is serious stuff and much needed. I am very pleased that our Marines will conduct their first in-country, demining training as part of PACOMs Humanitarian Mine Action program. I am certain that this effort will pay off in the end. *NOTE: PACOMs HMA Program is also being offered in Laos, Cambodia and several other countries in need of demining training. In the case of Vietnam, winning the hearts and minds of the Vietnamese people may also help efforts to find loved ones still unaccounted-for from the Vietnam War. This program — and similar humanitarian efforts — mean a lot to families like mine. Specific details relating to the HMA Program were gathered from military press releases.